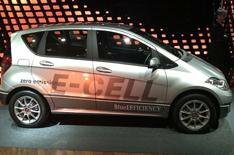 Mercedes-Benz A-Class E-Cell | What Car? This is the Mercedes-Benz A-Class E-Cell, and while many of the electric cars here at the Paris motor show are no more than concept models, this isn't. Mercedes will produce 500 E-Cells, and lease them in several European countries, including Germany, France and the Netherlands. However, it will only be built in left-hand drive, so it won't come to the UK. Also unlike many electric cars, it demands no compromises from the buyer. The car is based on the existing five-door A-Class, but because the sandwich construction means the batteries can be located under the floor, the E-Cell is every bit as spacious, practical and safe as the standard model. Mercedes also says the resulting low centre of gravity means the car is still enjoyable to drive. Its two lithium-ion batteries produce 67bhp (with a maximum of 94bhp available for short periods) and give the car a range of more than 120 miles, as well as a 0-60mph time of 14 seconds similar acceleration to the existing diesel-engined A160 CDI. According to Mercedes, recharging the batteries to 50% capacity takes eight hours when plugged into a conventional domestic socket or three when the car is connected to a dedicated wall-box or roadside charging point. The car also includes a pre-start climate control function. This pre-heats or cools the interior to a set temperature while the car is still charging.